Indeed, a quick scan of what’s called the CAT Transform (CAT stands for Change, Aftereffect and Trend) image reveals clear evidence of change to Alberta’s landscape over the last decade. Distinct patterns of urban expansion around Alberta’s municipalities are visible. So is the impact of resource extraction and natural disturbance, like wildfire. You can even see forest regrowth in areas. To construct a CAT Transform image, the ABMI Remote Sensing Group essentially creates a flipbook of satellite images taken over a period of time. 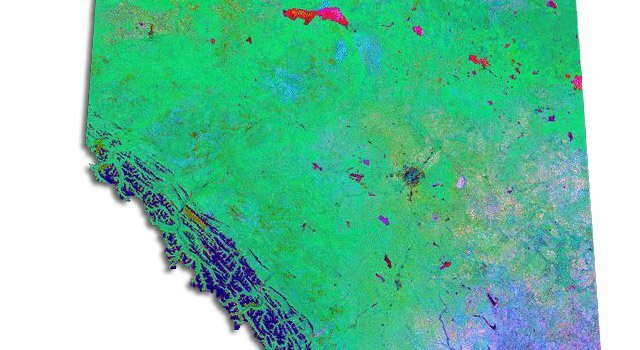 The type of satellite images (derived from NASA’s MODIS instrumentation) used allows the researchers to detect changes in the health and density of vegetation in a particular area, which can reflect changes in land use. Products such as this one are groundbreaking; they represent a whole new approach to visualizing regional landscape change, and represent just one of several ongoing projects currently spearheaded by the ABMI’s Remote Sensing Group [stay tuned for a future blog post on the CAT Transform]. Tools such as the CAT Transform are increasingly in demand in Alberta since the establishment of the provincial Land-use Framework in late 2008. In the context of rapid population growth in Alberta and increasing global demand for our natural resources, the Land-use Framework has laid out seven strategies to achieve “smart growth” in Alberta, or economic growth which aligns with the social and environmental values of Albertans. Under the Framework, local stakeholders–land and resource managers, industry, government, and communities–are required to work together to achieve regional targets for habitat, biodiversity, and human footprint. To do this, remote sensing expertise and products are essential. 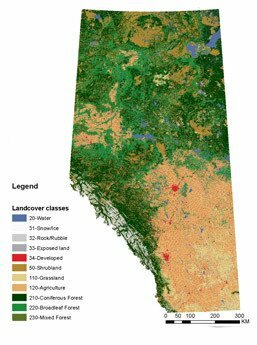 Comprehensive and accurate data on provincial land cover that can be derived from remote sensing technology and analysis, for example, are necessary to realize the “smart growth” envisioned by the Land-use Framework. With this in mind, a key area of focus for the ABMI Remote Sensing Group has been the completion and release in 2012 of the ABMI Wall-to-wall Land Cover map circa 2000. This release marked a significant milestone: the map was the most accurate and complete representation of Alberta’s land cover, including forest types, grasslands, shrublands, water, rock and human development, until the recent release of the updated ABMI Wall-to-wall Land Cover map circa 2010 [see upcoming blog post on the development of the land cover maps]. But their value is clear. In addition to their role in support of land-use decision making in the province, the ABMI land cover maps allow ABMI scientists to model the abundance and range of various species across the province, as well as do trend monitoring of various habitats. In other words, it’s a key tool in the ABMI’s biodiversity monitoring toolkit! For more information on the ABMI Remote Sensing Group’s research projects, please join us for our upcoming workshop “Remote Sensing of Alberta’s Dynamic Landscapes” on Jan 23, on the University of Alberta campus in Edmonton. For more information and to register, click here. The ABMI’s Remote Sensing Group is based at the Foothills Facility for Remote Sensing and GIScience in the Department of Geography at the University of Calgary. Core members of the group include its Director, Dr. Greg McDermid, remote sensing scientist Dr. Guillermo Castilla, and research technician, Jennifer Hird (MSc). The research described herein was funded by a three-year NSERC Collaborative Research and Development Program awarded to Dr. McDermid, Dr. Castilla, and ABMI science co-director Dr. Stan Boutin in collaboration with industry partner Alberta-Pacific Forest Industries.